Back in, I think, sixth grade, my teacher read us the novel The Girl Who Owned a City, in which a virus has swept across the world killing everyone thirteen and older. I was completely drawn in to the idea of this small, vulnerable part of the population having to figure out how to survive without their natural guides and protectors. Of course, as often happens, the book had lost quite a bit of its luster when I picked it up again as an adult. It didn't quite match up to the thrilling masterpiece I remembered from my youth. There are several holes in the plot you could drive a truck through, the main character is far less sympathetic than she was in my imagination, and it was much more didactic than is good for what should be a fast-paced story. At times it seemed that the author had written the novel merely as a vehicle for his particular political philosophy. It was disappointing. Regardless, I'm still nostalgic for how that book made me feel at age 11 and I was pleasantly surprised when I found in Partials the grown-up, well-written inverse of this tale. 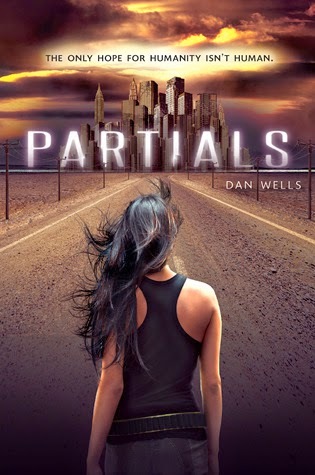 Partials is a worthy and stand-out addition to the plethora of current dystopian future series. Years ago, American scientists created "engineered organic beings" to be soldiers in a war with China. Visually indistinguishable from humans, these Partials won the war but eventually rebelled against their second-class status. To prevail over their former masters, they released a virus to which they were immune, but that has wiped out the vast majority of the human population and has killed every child born in the past 12 or so years as well. No children means no future and the few human survivors holed up on Long Island are desperate to find a cure. So far, the strategy has been to require all women to get pregnant within two months of their 18th birthday and to continue having children as quickly as possible, reducing women of child-bearing age to little more than "just a uterus with legs." But, theoretically, if enough babies are born at least one has to survive, right? Not so far. Thousands of infants have died within a few days of being born. Kira, a sixteen-year-old medic-in-training, is determined to find the answers, especially when she finds out that a dear friend is expecting. Since all other avenues have failed, she decides to branch out from humans: she needs to study a Partial. She and a few friends plan an excursion in Partial territory to find and capture one, but, naturally, it ends up being far more than they bargained for. This sci-fi story has action, moral dilemmas, political intrigue, fascinating non-didactic philosophical discussion, just a touch of romance, unexpected twists, an optimistic-against-all-odds tone, and a great cliff-hanger. The library just notified me that the second book in the sequence, Fragments, is ready for me to pick up and I can't wait to dig in! ** In the interests of full disclosure, let me mention the author Dan Wells and I were friends eons ago during our freshman year of college. I haven't spoken to him in years and didn't even know he was a published author until very recently. I'm thoroughly enjoying catching up on his oeuvre.